Lightweight lotion softens and hydrates skin while diminishing blackheads and blemishes. A light exfoliating lotion for blemish-prone skin. This gentle exfoliating lotion with 2% BHA (salicylic acid) removes built-up dead skin cells to reveal radiant, silky-soft skin. Formulated with a blend of plant oils and antioxidants, this moisturising lotion softens dry, rough skin and soothes redness while diminishing blackheads and blemishes. Apply once or twice daily after cleansing and toning. Apply a coin-sized amount over the entire face, including the eyes (avoid the lower lash line and eyelids). Do not rinse. For daytime, always use a moisturiser containing a broad-spectrum sunscreen rated SPF 30 or greater. Allergic to aspirin (acetylsalicylate)? Do not use this product as it contains salicylic acid (BHA). The first time I ordered this exfoliant (3 years ago) I was sceptical about it because its texture and smell were quite different from the products I used to use. The results were quick to see - my skin became brighter and smoother. I have enlarged pores ( everyone in our family does), and although they didn’t become smaller, nor they disappeared, they became considerably cleaner, which means I stopped having the breakouts caused by clogged pores. I highly recommend this product, it just takes a little effort to get used to its texture and smell, and you’ll see the results very soon. I have used this exfoliant for months, with very good results. Therefore, I ordered it again but to my unhappy surprise the product has changed entirely. Before ordering, I double-checked, but of course I didn't compare the ingredients. Turns out that while the previous version was more cream-like, this one is more gel-like, it's transparent and much less hydrating than the previous version of this product. Very disappointing! Customer Care: We are sorry to hear that you are not happy with the texture of the improved formula of this exfoliant. Please feel free to contact our customer care team to discuss other options. 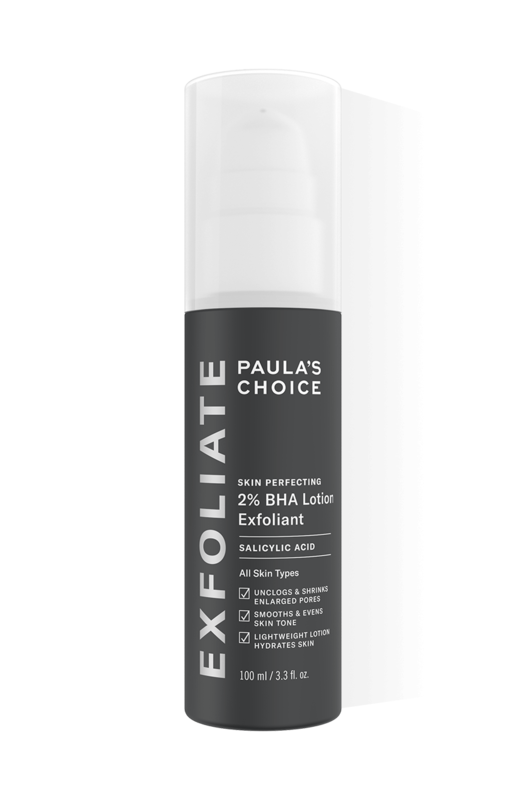 This is the only exfoliant I have found that works for me, not only from Paula choice but all brands and both BHA and AHA. I have dry to very dry skin and in winter were I live it is about -25 celsius. I can't use it to often in winter because then my skin gets to dry, but I use it more frequent other times of the year. I have been using it for about a year. I don't have acne but larger pores and sometimes minor "bumps" and redness. It seems that not only does my pores look smaller after using this but I also think that the anti-inflammatory effect makes a difference to my skin. It seems much calmer after use. PLEASE don't change anything about it! It is perfect for me. I don't have acne or a lot of impurities in my skin. I do have some larger pores around my nose and chin area. After using this a couple of weeks a noticed that the pores around this area looked smaller. I guessing that they not actually get smaller but that the BHA "cleaned" the pores from dirt and then make them appear smaller. I do find it a bit drying so I can't use it more then twice a week. I wintertime I try to apply it early in the afternoon so that it can work a couple of hours before I out on another moisturiser an hour before bed. Doing this seem to make it work but I don't wake up with dry and itchy skin, but smooth and hydrated. I have been using the Skin Perfecting 2% BHA exfoliant for a little over a fortnight and the results have been absolutely brilliant. I've honestly never had as clear and bright skin as I have these days. I've also been using the Skin Recovery Super Antioxidant Concentrate Serum with retinol and whether it's the two products combined or just one of the other, I've no doubt that I have found my new HG! The best BHA product for me. I have combination skin and this one makes it looks clear, healthy and glowing without feeling neither greasy nor drying. I just love it and also love how good it makes my skin look. I wish i could return this back! I was recommended this, because i have very dry acne prone skin. (I am treating my skin with acnatac) And it did nothing ecept for giving me a lot of whiteheads..Ufourtunatly the money back guarantee has run out. So now i just have an bottle ow waste. As someone who has battled pimples, black heads and little red bumps for many years, I have tried everything you can imagine out there. Of my thirty something skin care, makeup and hair care products I have at home, this is my number one go-to product that I just can't do without. It's so priceless to know that I can skip washing my face before bedtime after a nigh out if I'm too tired, knowing that as long as I put this on the next day, my face will still remain pimple free. I also love this product since I have very thristy skin, so I love that I can layer my serums and creams ontop of a non-greasy lotion for extra moisture. Love this product so much!!! I love this! It's amazing in mantaining my skin clear... I use it about 2/3 a week and it does wonders! I had started using glycolic acid to improve my skin texture, as I tend to get white bumps and milia. The AHA ended up irritating my skin after weeks of using it, so I switched to Paulas Choice 2% BHA lotion. This immediately calmed down my cheeks, and the milia have disappeared. The dry patches have also gone. Have now repurchased twice. The bottle can last a long time, but I use it am and pm, and all the way down my neck. Very good also at hormonal spot treatment.Can't live without it! I have had the 1% version before, and I thought that I could go for the 2% as my skin was happy with that. But the 2% version is pretty different texture, much thicker and creamy. Now after maybe 3 weeks I have got more black heads than with the 1% version. My skin is very sensitive, some rosacea, combination but dryish, and my pores are rather tight and I get black heads easily. (The best combination for me is the skin recovery line for cleansing and hydralight + this for moisturizing. And during the winter some hydralight for the dry areas.) I will order the 1% again, and use this for my legs and arms before the summer. This product is awesome! It does what it claims overnight. I live in Greece and though there are products that claim that they include salicylic acid, they do not have the percentage that wil do the exfoliation. I have asked from a pharmacist to prepare for me a 2% BHA and he did by using the Avene cleanance K. They actually added more salicylic to the current formula. But when I tried PC BHA 2% I realized how a proper BHA should feel. The Avene cleanance K stays on the face and takes all night to be absorbed. Skin Perfecting 2% BHA Lotion Exfoliant needs minutes and then I have a beautiful skin. It doesn't feel greasy, or heavy and the smell is neutral. Especially now that it is hot and maybe humid, my face is like I have put nothing. In terms of pores unclogging it works wonders. Of course I have started the process with the custom made BHA but it took 2 weeks to see some results and with Skin Perfecting 2% BHA Lotion Exfoliant I saw some stubborn pores to clear in 2 days! I have tried most of Paula's exfoliants and have found them all vastly superior and more pleasant to use than tradiotional exfoliants. However, the texture of the liquids and gels doesn't please me as much as this lovely, smooth cream. I first tried the 1% lotion and liked it (the smell is wonderful, by the way, it reminds me of gooseberries) but then I decided to give this one a go, and boy was I in for a treat! The 2% lotion feels deceptively mild on the skin, it's creamy and moisturizing but really packs a punch. Surprisingly it feels gentler than the 1% version, too. I have redness around my nose, chin and eyebrows and using the BHA lotions, especially this 2% lotion, has really made a difference in evening out my skin tone and texture. My skin has not looked as good as this past winter/spring in ages, even though those two usually are the hardest seasons for my skin. I hardly ever reach for my other AHA or BHA exfoliators any more, though I expect to repurchase the 8% AHA as well when I run out. I've had excellent results when combining this with the weekly AHA-treatment. Applied twice daily it seems to keep my skin acne-free and moisturized. But! I've used half the bottle with a nice creamy consistency but suddenly the formula is full of small, seethrough particles, looks and feels like short (a couple of mm's) glassfibers. It doesn't affect the performance but is quite annoying to pick of my face after application. My only reason for not buying the lotion again, I'd rather give the liquid a try. Customer Care: Thank you for your review. We are sorry to hear of the fibers in this product. This is quite unusual, but now and again can occur. These fibers are the ingredient salicylic acid, which usually is absorbed in the lotion. It is not harmful and the product is still effective, but we will contact you to solve the issue to your satisfaction. I am not sure how to rate this product. For now, it cannot get more than 2 stars from me. I have bought it five months ago, have been using it faithfully mornings and nights (in a combination with a moisturizer, so my skin is not dried out), yet I do not see any changes. It didnt break me out, but also didnt clean my blackheads or my pimples. My face looks more or less the same as it did for the past 5 months and before. I am not sure if I should continue using it or start looking for an alternative. I have to say I am disappointed after all the raving reviews I have read. This is the one product I will use always and always, couldn't do without. I am 42 and have dry and sensitive but very blemish prone skin. This was the first product that has helped me with breakouts and at the same time it is very gentle. At first I didn't like the glue like smell but the great results got me over with it very fast. I have also tried the extra strength CLEAR 2% liquid but that was too much for my skin, it became flaky and red. Since I have very dry skin I always put a serum and a moisturizer on top of my BHA. Serums and moisturizers I change depending the time of year etc. but this one product is always in my routine. + Reduced my bleakheads with frequent use. Great packaging with pump, product lasts for months and travel friendly. - Thought I'd prefer it as a lotion, turns out I got bored with it's texture on my skin. Not as hydrating as I had hoped it to be. Did nothing for blemishes or acne on me. " Lightweight lotion formula provides hydration and keeps skin silky-soft " Did not live up to this claim at all for me. I have acne and very dry skin, it felt heavy and far from silky-soft. I would recommend it for normal skin. No repurchase. Customer Care : We are sorry to hear of your experience with this product. While this response is not typical, we do understand that each customer is uniquely different in how they will respond to products or ingredients. This along with everyday environmental factors can sometimes play a part in how someone will ultimately respond to a product or combination of products. We are more than happy to send you samples of other BHA textures to try. I also tried experimenting with the weekly 10 % aha resurfacing treatment with the bha 2% lotion. This product did nothing for my skin, blackheads, pimples or the cystic acne i got from the aha. I triede only using one, one day and one the other (always bha for the day and aha for the night). I tried using only one at a time and i tried using both on the same day. No results. I also felt the lotion was sitting on the skin and i have dry skin. Normally my skin drinks lotions and creams right up.Customer care : Thank you for your review and we are sorry to hear that you did not get the results as expected. We generally advise BHA when you have blackheads and blemishes, and AHAs are best for sun-damaged, thickened, dry skin where breakouts are not a problem .The primary difference between AHAs and BHA is that AHAs are water-soluble, while BHA is lipid-(oil) soluble. This unique property of BHA allows it to penetrate the oil in the pores and exfoliate accumulated skin cells inside the oil gland that can clog pores. Skin care is tricky. Each person will potentially respond different to products and ingredients. If you have dry skin prone to breakouts it would be best to stick with this exfoliant and continue using to see how your skin ultimately responds as breakouts are most likely due to hormone changes. You may consider trying the 1% BHA lotion to see how this works for you. Please contact customer care with any questions. Cecilie - This saved my skin! I switched to this as a change from my Resist 5% and 10% AHA exfoliants. It was not a good idea. My skin became very dull and I had some ugly little red breakouts while using this product. I've since repurchased the Resist range of exfoliants and my skin if fine. I'm a big fan of Paula's and use only her products. Customer Care Response: Thank you for your review. We are sorry to hear of your experience with this product. While the response you have indicated is not typical, we do understand that each customer is uniquely different in how they will respond to products or ingredients. This along with everyday environmental factors can sometimes play a part in how someone will ultimately respond to a product or combination of products. Please contact customer care with any questions. This is the product I cant live without! It has changed my skin condition, giving it a chance to get rid of blemishes, spots and blackheads. Can't be grateful enough, thanks Paula ! Martine - love love love this. This really works! This product have done it's job so well for my skin! This is my all-time favorite skin care product. I've been battling acne and large pores for years now. The only decent results I got from prescription retinoids, but unfortunately they were way too harsh on my sensitive skin, causing excessive redness and flaking. I've now reduced the strong retinoids to 2 times a week (while using softer ones in between), while combining with this 2% BHA lotion twice a day and my skin hasn't looked better! I didn't think highly of salicylic acid before, since I could already find it on the ingredient list of my old toner, which did nothing for my skin. But it's all about the concentration! Will repurchase again and again. IheartNY - Finally a solution for my hormonal breakouts! After going off the pill I started getting really bad and uncontrollable breakouts on my cheeks that would also leave ugly, long-lasting scars. I really struggled to get rid of the breakouts, but no matter what I tried, nothing seemed to work, which was extremely frustrating. But then I tried the 1% and 2% Beta lotions. I started with the 1%, but it didn't deliver the quick and effective results that I was eager to see. So I quickly switched to the 2% and saw a positive change almost immediately! It really helps clear my nasty hornomal breakouts AND it seems to be clearing up my scars quicker than normally. However, when I started using the 2% every day both mornings and evenings, it seemed to irritate my very sensitive skin. But after cutting down to only using it every second night before bed, I'm getting great results again. I have combination skin and so I used to get quite painful spots; mostly on my chin. I started to use the 2% BHA last September and it is now that one product that I use that I would be lost without. I started by using it every three days. The first couple of times I could literally feel and see the dead skin coming off. Then I used it every other day and now i am using it every day and there has not been and there isn't a blemish in sight!! I am very grateful for this product- thanks Paula. Also, I am only half way through the bottle and I have been using it for 8 months! Try it, you won't be disappointed. Not only this does the job, it's also a lot of product for the money. I bought this back in January, applying a little once or twice a week at night, and the bottle is still going strong. This product is perfect for you if you have normal/combination skin. It has helped my skin and reduced my blemishes. I Absolutely love it! Aqua, Butylene Glycol (hydration), Polysorbate 20 (emulsifier), Cetyl Alcohol (thickener), Salicylic Acid (Beta Hydroxy Acid, exfoliant), Ammonium Acryloyldimethyltaurate/VP Copolymer (thickener), Cyclopentasiloxane (hydration), Sorbitan Stearate (emulsifier), Camellia Sinensis (Green Tea) Leaf Extract (antioxidant), Lauric Acid (fatty acid), Allantoin (skin-soothing), Glycerin (skin-replenishing ingredient), Glycyrrhiza Glabra (Licorice) Root Extract (plant-based antioxidant soothing agent), Avena Sativa (Oat) Bran Extract (plant-based antioxidant soothing agent), Epilobium Angustifolium (Willow Herb) Flower/Leaf/Stem Extract (plant-based antioxidant soothing agent), Dimethicone (silicone skin-conditioning agent), Xanthan Gum (thickener), Magnesium Aluminum Silicate (absorbent slip agent), PEG-40 Stearate (thickener), Sodium Hydroxide (pH-adjusting agent), Hexylene Glycol (solvent), Disodium EDTA (chelating agent), Ethylhexylglycerin (skin-conditioning agent), Phenoxyethanol (preservative), Caprylyl Glycol (preservative). What makes the 2% BHA Lotion different to the 2% BHA Gel and Liquid? The primary difference is texture. The 2% BHA Lotion is a lightweight cream, while the 2% BHA Gel has a silky gel texture and the 2% BHA Liquid has a thin, toner-like consistency that's best applied to a cotton pad. All of them are formulated to provide the same key benefits to your skin. Which one to choose is a matter of personal preference and your skin type.